Just can't take to this place - the layout is too much like sitting in a series of corridors as opposed to being in a proper building. Staff are always disinterested and the (expensive) ale never really hits the mark. Another visit with time to kill before my train. Bar staff still unwelcoming. Just a poorly paid job to them. Never seem to see the same people twice. Anyway the beer was reasonable if expensive. Three different ales tasted on my visit. Seating area was taken up by several people who let their baggage use the seats. One guy had a table with 4 seats and it was just him with three bags on the seats. A crowd of elderly Geordies asked him twice if anyone was using the luggage seats. I think he got the message and put his luggage on the floor. One of the barmaids commented about "that sort of thing happens a lot but people are too frightened to complain". Not a great pub but one to see the world go by. Seems to be resting on it's laurels a bit - sat with a duff second rate pint of Hophead while people around me were bitching about the wait and quality of their feedstuffs. More expensive than others visited on the day, but had returned for a second time as great selection of real ale session beers and plenty of alternatives for accommodating over ten of us from standing space to seating either indoors our half outdoors overlooking station concourse. Good venue for tube from Kings Cross especially up to Arsenal FC. 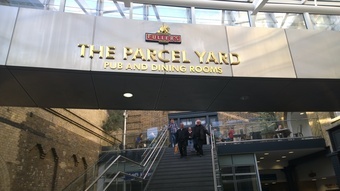 A decent station pub at the far end of Kings Cross with a good selection of well kept cask ales. It''s pricey, but I suppose that''s not unexpected at a London terminal.